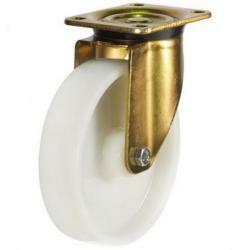 Swivel Castors and Wheels preform best on even surfaces, due to their extra flexibility. 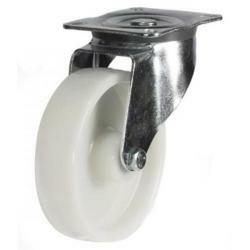 We supply a large range of quality Castors and Wheels, available in a variety of options, with different centres, wheel diameters, capacities, sizes and styles, with different material castor housing and brackets, bearings, a selection of tread depths and heights to choose from. They work via the pressure which is applied to them through their mounting plate, causing the offset to swivel in line and face the opposite direction to the moving application. Swivel Wheels are used for a number of Applications within many diverse industries, accommodating to the majority of heavy duty capacities too. A swivel castors smooth 360° manoeuvrability ensures it can easily swerve around corners and obstacles at home or in the work place. Single or twin wheel options are available, depending on your applications requirements and whether extra stability is required. Swivel Castors are particularly popular within the retail, hospitality, agricultural, automotive, and medical industries. The horizontal distance between the centre of a wheel axle and its vertical axis is noted for each of our castor head bearings, ensuring you choose the right option for your application. Our online Catalogue displays many Swivel Castors and Wheels throughout our range, so please browse through. All individual specifications can be seen when selecting a product image. If you have any questions regarding any of our Swivel Castors and Wheels, or would simply like some advise, then please Contact Us today to find out more.